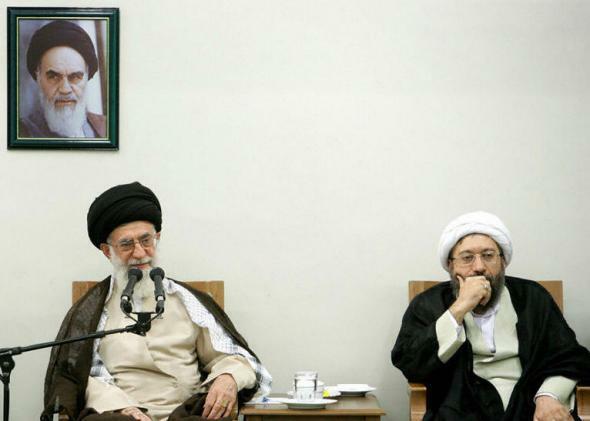 Iran’s Khamenei: Israel must be annihilated. He then culminated by posting a “neat table,” as Haaretz puts it, that lays out nine key questions on why—and how—his plan to destroy Israel should be implemented. The post begins with the basic: Why? Because throughout its existence “the fake Zionist regime has tried to realize its goals by means of infanticide, homicide, violence & iron fist.” But rest easy, Iran definitely does not want “the massacre of the Jewish people” but rather Iran has proposed “a practical & logical mechanism” to eliminate Israel through a referendum involving “all the original people of Palestine, including Muslims, Chrsitians and Jews” anywhere in the world. Until the day when Khamenei’s plan can be realized, “powerful confrontation and resolute and armed resistance” is the only way to deal with “this ruinous regime.” And what should be the first step? Arming the West Bank. Isn’t a compromise possible? “The fact that Yasser Arafat was poisoned and killed by Israel while he had the most cooperation with the Zionists proves that in the viewpoint of Israel, ‘peace’ is simply a trick for more crimes and occupation,” Khamenei writes. The post comes days after the Wall Street Journal revealed that President Obama wrote a secret letter to Khamanei that suggested the two nations could cooperate in fighting against ISIS. In the letter, Obama said that any cooperation would be dependent on Iran reaching a nuclear deal with global powers by Nov. 24. Mitt Romney harshly criticized the letter on Friday. “That the president would write a letter of this nature, in effect legitimizing a nation and a leadership that is violating international norms and is threatening the world, is so far beyond the pale, I was stunned. I was speechless,” Romney said, according to the Washington Post.